To boost your confidence in your ability to perform Power Yoga, try this asana. This asana requires you to pay special attention to balance. The extended foot one leg stand posture (utthita hasta padangusthasana) trains you to incorporate all your natural tools into your Power Yoga practice. In Sanskrit, the word utthita means “extended,” hasta means “hand,” and padangustha loosely translates to “big toe.” In this posture, you stand on one leg while extending your other leg forward and grabbing your big toe with your hand. Stand with your spine straight and your shoulders back, and extend your arms down the sides of your torso; keep your vision forward. Close your eyes for a few slow, deep yoga breaths while you maintain good posture. Ground yourself firmly onto the floor, and be conscious and aware of your breathing. Open your eyes, and place your left hand on your left hip. Pick your right foot up off the floor and, balancing on your left foot, bend your right knee and place your right hand around the outside of your right knee. You should now be balancing on your left foot, holding your right knee with your right hand. Pull your right knee 90 degrees toward your right side as you open your hip. Keep your torso and chest facing forward, and pull your right leg to your right side, turning your head to your left side and looking over your left shoulder. If you have trouble balancing, place your left hand on a wall for support. Listen to the sound of your slow, deep breaths. 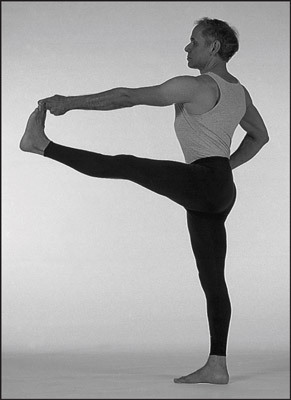 Engage your Mula bandha by tightening your perineal muscles. Engage your Uddiyana bandha by firming and lifting your stomach. Direct your gaze (drishti) by looking over your left shoulder, parallel to the floor. Hold this position for 5 to 10 slow, deep breaths. Release your energy locks, turn your head back to the center, and exhale as you bring your right leg back to the center and lower your foot to the floor. Repeat these steps, but this time balance on your right leg, lift your left leg off the floor, and direct your drishti to the right. If you’re an advanced student, you can do a full version of this posture. Follow the same series of steps, but instead of holding onto your knee, grab your right big toe with the first two fingers of your right hand and fully extend your leg out to the front and off to the side.